Moving time: 4 hr 41 min. 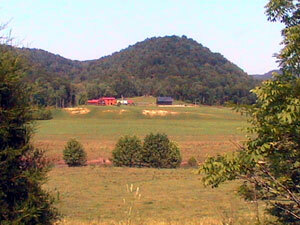 The grass in Kentucky is green, not blue. This morning was very foggy. The church was near a river in a valley and the fog settled in like pea soup. 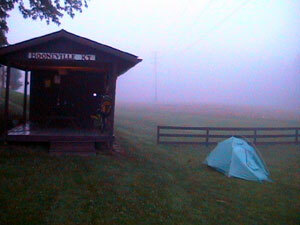 The tent was soaked and it was way too foggy to ride early in the day. I got up at first light, ate breakfast and cleaned my bike. The rims were very dusty and the bike was generally dirty. After cleaning and lubing the bike it rolled like a champ. The first picture was taken on the night of 6/20. The second picture is this morning - you can't see anything beyond the fence! I got started about 9:00am on the road and the fog cleared shortly after climbing out of Booneville. I could have started earlier but couldn't tell how far the fog went up the valley. The ride was very nice today as compared to the past week. The hills weren't too bad - just a few steep ones. 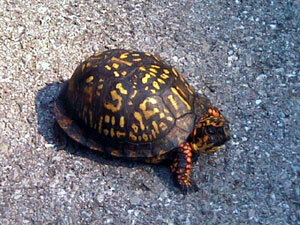 There were some nice, big homes, tobacco farms, and a few turtles along the road. 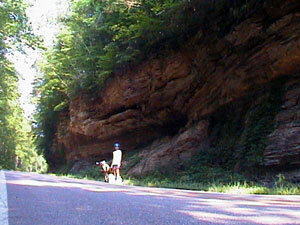 There were a few nice cliffs along the road and much of the route was lush with vegetation. There were many vines on the cliffs and trees. 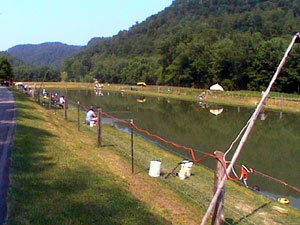 The second picture is of a fishing hole that about 30 people were trying to catch stocked bass from. They charge $10 for a day of fishing here. It is mostly just a meetin' and small talkin' place. By the time I reached Berea it was a scorcher. It is supposed to be hot, hot, hot and humid for the remainder of the week. The only possible relief are the possible thunderstorms in the afternoon. People are more likely to drive Chevys and Dodges than they are in Virginia (where they only drive Fords). 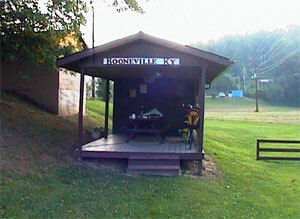 I stopped to eat at a diamond-in-the-rough gas stationit was a 20 mile ride through a lot of nothing from Booneville to this gas station. I also ate at Mario's buffet in Berea once I reached town. They have a substantial pizza and pasta buffet with a salad bar for $5.00 there. I met another TransAm rider this evening named Larry. He's a retired police officer from Chico, CA and has a great deal of bicycle touring experience. 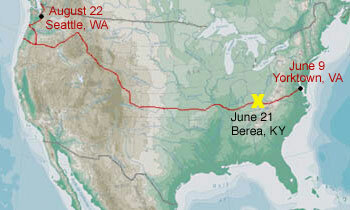 He has already completed thousands of miles of riding and is about three weeks into the TransAm heading west with me. Berea College is here in town. It is a unique college on a beautiful campus. This town reminds me of my hometown, Lock Haven, Pennsylvania. Kentucky has this soda I've never heard of before - it's called Ale81 and is sold everywhere around here. I haven't tried it yet. I made the first mail drop today. I was planning to arrive here on the 20th but got in on the 21st. Not too bad considering the difficult time getting here. I'm fully resupplied with Halt! I've only had to use it on two dogs so far who tried to nip at my legs. I've been chased by at least 100 dogs so far. Some dogs are too lazy to run after me while others are up for a good run. For most of them, their bark is far worse than their bite but I've had a few close calls. The log book in Booneville showed that Teresa and Hank (eastbounders I saw 8 days ago) were here 12 days ago so I'm moving at a pretty good clip.